IT in the Frozen Tundra: Bachelor's Degree Complete! Congratulations! Your mentor has recommended you for graduation. To apply and be considered for graduation, you must complete the online Graduation Application. We cannot process your graduation until this application has been completed, so please complete your application as soon as possible. To access the Graduation Application please click here. If you have any trouble accessing the Graduation Application, please contact the Records Office at graduation@wgu.edu. I am finally done with my degree program! I started this journey in in early 2014, after being turned down for a job interview with a great company because of my lack of four-year degree. 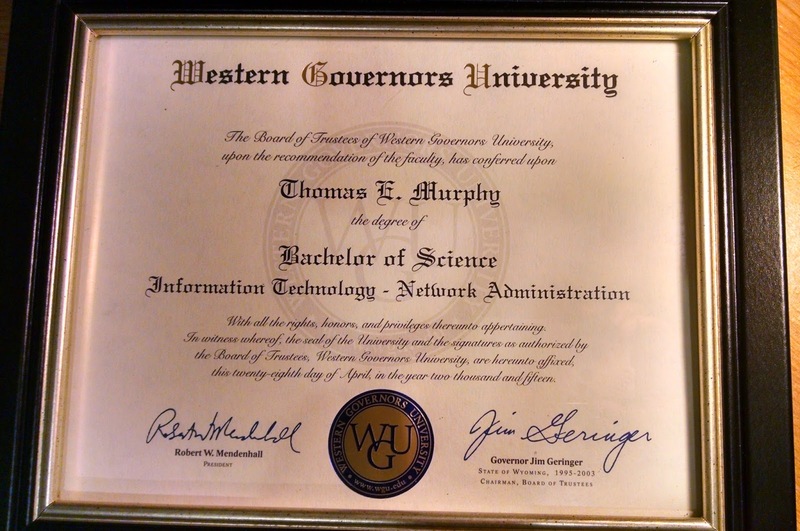 I began my first term with Western Governor's University on April 1, 2014. And now, just over a year later, I've completed the program! It has been challenging at times to keep focused and complete the work, but as I moved closer to the end, it became easier to focus and concentrate on the goal ahead. Now it's time for a short break. My wife is also finishing up her bachelor's degree. It wasn't easy having both us studying, working full time (with a new job for me) and raising two kids, but we are almost there! My degree is here! Woohoo!